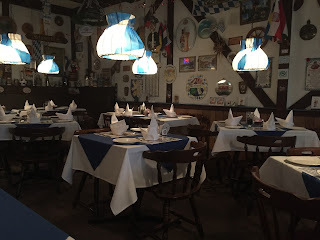 A random craving for schnitzel brought a friend and I to Little Bavaria. Located in a plaza at Eglinton and Markham, it wasn't what I expected when I entered; it was completely decorated like a German pub. So festive! White linens and flags everywhere! We seated and scoured the menu. There's meat with more meat and a side of meat. Even though the menu has a lot of meat, there ARE vegetarian options. Sweet! I went with the Jäger Schnitzel($18.95). It has a red wine sauce with mushrooms and onions. 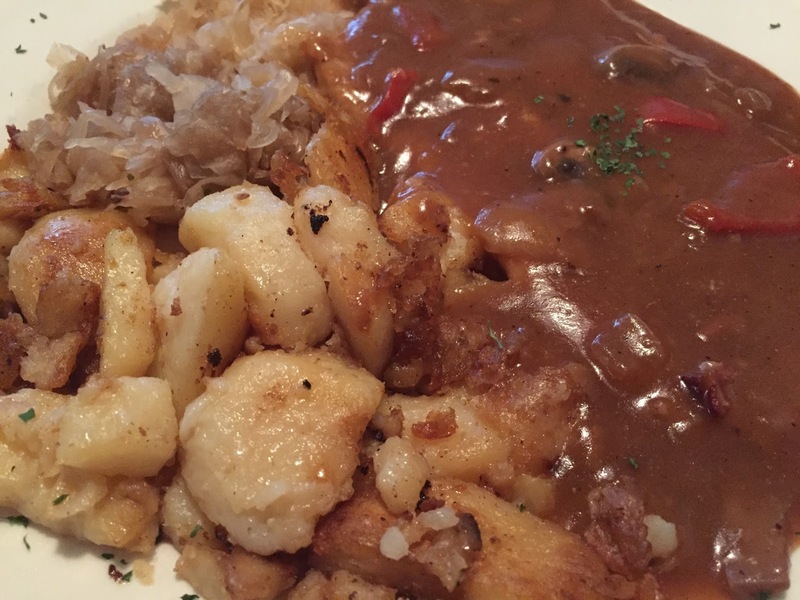 My friend went with the Bavarian Plate($22.95). It comes with schnitzel, kassler and krainerwurst. Both came with soup or salad and 2 sides. SO MUCH FOOD. The schnitzel was ok, a little fatty though. The Bavarian Plate was good! I had a taste of each meat and they were very tasty! Know what else is good about German restaurants? German Beer! I got myself a pint of Erdinger and enjoyed my meal! They also have a selection of German wines and spirits. A nice change from regular restaurants. The service was good. It wasn't busy and one server was working. There was a large party there, but it didn't affect the speed of our food or service. The food was cooked fresh to order.